Taking over the fields of Grant Park for four days each summer, Lollapalooza is a behemoth of a music festival, welcoming an estimated 100,000 attendees to a sea of stages, brand activations and concession stands set beneath the beating sun. This year, pop princess Ariana Grande, rapper Childish Gambino, alt-rock duo Twenty One Pilots, rockers the Strokes, psych act Tame Impala and EDM hit-makers the Chainsmokers headline the main stages. 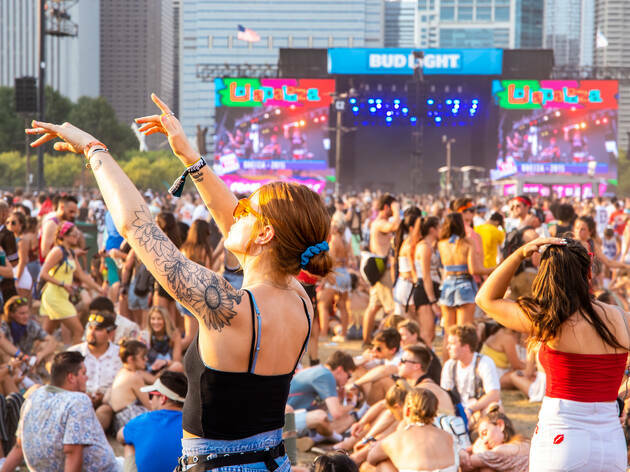 Some people come for the music, some come for the people-watching and others come to get drunk on a blanket in the middle of a field—there's no wrong way to Lolla. Four-day passes to Lollapalooza are currently on sale, including general admission and VIP varieties. One-day tickets to the festival will go on sale in the coming weeks when the festival's single-day lineups are released. El stop: Red to Monroe; Blue to Washington; Orange, Green, Pink, Purple (rush hrs), Brown to Randolph. Bus: 3, 4, 6, 10. The biggest music festival in Chicago is certain to have its criticisms, but if you know what you're in for, it's totally worth it. Ignore the drunken festival goers and pick a few bands you really want to see and focus on those. Don't miss the on site activations either, you'll find some interesting things! Lollapalooza is the best music festival. And the offerings just get better year after year. This year they're bringing Radiohead to Chicago! And four days of live music?! There's always a great act to see on one of the many stages. I love lolla! Alas, recently it's gotten HUGE & typically overcrowded with a very young audience. However, what's not to love about multiple stages in Grant Park??? The food at lolla has really catapulted in the past few years. They have lots of great festival food. Another problem is....the concerts go on rain or shine so it's completely weather dependent. 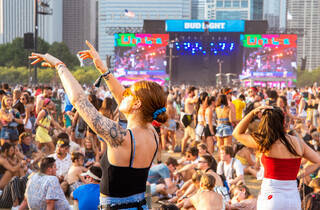 The surge of EDM over the past few years has turned the Lollapalooza crowd much, much younger. Five years ago, you could buy a ticket at the gate. Now, they sell out almost instantly. This year's lineup seems like a shallow attempt to bring an older crowd to the festival. With Paul McCartney and Metallica headlining, it might be a successful attempt. Whatever the case, the Grant Park fields will be muddied, the streets will be littered and a legion of lovers will dance around the Buckingham Fountain in praise of good tunes, which is always a good sight to see.